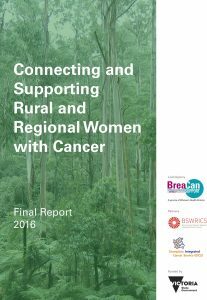 In 2015, Counterpart partnered with the Integrated Cancer Services of Barwon South West and Grampians regions to undertake a project to improve understanding of the support and information needs of women affected by cancer in rural and regional Victoria. The Connecting and Supporting Rural and Regional Women with Cancer project was funded by the Department of Health and Human Services, Cancer Strategy Unit. The project report outlines the aims, methodology and findings of the project, and recommendations.